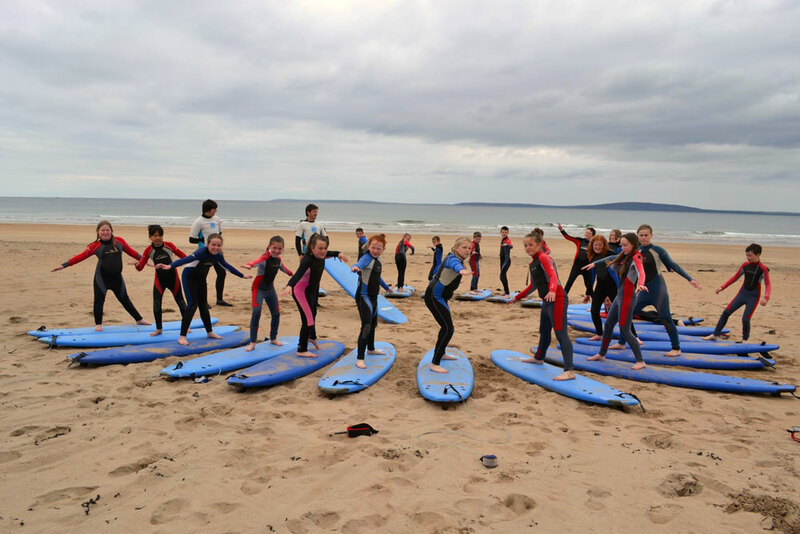 Teachers, we invite you to consider Ballybunion surf school for this year’s school tour, we have designed healthy, fun and age appropriate activities suitable for all fitness levels and supervised by well trained, experienced staff. We are open all year round and provide all necessary insurance and child protection policies. All activities are designed to improve personal self confidence, develop team building skills and experience surfing in a fun and safe way. We understand that some teachers love to join in while others don’t and that’s fine with us the only supervision we require is lunchtime! We provide all equipment, boards and wetsuits. Our staff are fully trained and water activities are run by qualified beach lifeguards. Staff are also regularly trained in child protection and first aid. Along with a 2 hour surf lesson, and a guided tour of Ballybunion Sea Rescue, you can choose from one of two great activities to round off you school tour – a swim at Ballybunion Health & Leisure Centre, or a visit to Listowel’s historic Lartigue Monorail. Pat O’Callaghan, Principal, Scoil Naomh Padraig, Knocknasna, Abbeyfeale, Co.Limerick. Arrive, walk down onto beach – brief introduction and change into wetsuits. 10.00 am – Learn about the ocean – We’ll teach you about water safety and awareness of the sea, surf instruction on the beach and warm up games. 10.30 am – Hit the waves – The surf instructor will be in the water with the children giving continued instruction and encouragement. 12.00 pm – Lunch followed by a guided tour of Ballybunion Sea Rescue Centre, which was founded in 1986 to provide a rescue service to the locality of North Kerry. Children will be given a guided tour of the centre, manned by Search & Rescue volunteers. The centre is full of gadgets & equipment, and even has a D-class semi-rigid inflatable boat and an Atlantic 21 boat. The kids will be fascinated. 1.00 pm – Option 1 Swim at Ballybunion Health & Leisure Centre, the children get to enjoy the 20m swimming pool, the jacuzzi & sauna (there’s even a children and toddlers pool for the wee ones). There’s also a coffee and juice bar, and a jogging track for any budding athletes. 1.00 pm – Option 2 Visit the historic Lartigue Monorail, located in nearby Listowel, this museum offers visitors of all ages the opportunity to experience a unique form of rail travel. Your visit includes a short journey on a full scale diesel powered replica of the original monorail. Before or after your journey, you can visit the Lartigue museum to watch a film of the original Lartigue and see models, displays and memorabilia of the Lartigue and main-line railways. We provide volleyball and soccer during lunch, and if the weather is bad we have indoor facilities. The price of Option 1 is €19 per student – €15 for the surf lesson & tour of the Sea Rescue, and an additonal €4 for the swim at the Leisure Centre. The price of Option 2 is €18 per student – €15 for the surf lesson & tour of the Sea Rescue, and an additonal €3 for the Lartigue museum. Celine Dooley, Principal, Meelan Primary School, NewMarket, Co.Cork.